FIRST OFF...Sending my love to Nancy as we celebrate the first anniversary of our date to the zoo...the date that began our wonderful relationship. I did get an email from Paul Jeffrey, who we featured two weeks ago during our week-long New Music Marathon. He thanked everyone for their comments and appreciated the feedback. He also let me know that his new album is available HERE. The members of Slayer - Tom Araya/bass, Kerry King and Jeff Hanneman/guitars, and Dave Lombardo/drums - spent a couple of weeks in a Southern California recording studio last month tracking three new songs, including the one featured in a clip from the UK's Metal Hammer magazine (which you can find HERE) - "Psychopathy Red," a Hanneman-penned track that gives a chilling look into the twisted mind of Andrei Chikatilo, a notorious Russian serial killer. Another 'exclusive' Slayer-in-the-studio clip is now playing on Spin.com HERE. Slayer kicked off the "Unholy Alliance Tour -- Chapter III" the last week of October with a sold-out show in Manchester , England with Mastodon, Trivium and Amon Amarth. The 24-concert tour will wrap up in Helsinki on November 27. Slayer then plans to return to the studio early next near to finish the new album. 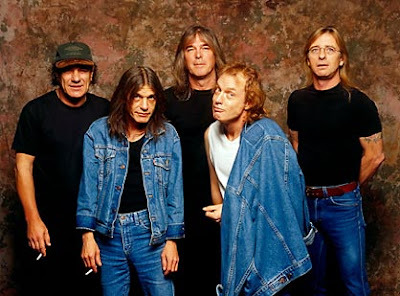 I think many bands would love to be AC/DC right about now. Black Ice, their latest release, remains the #1 selling album in the US, Belgium, Germany, Denmark, Norway, Argentina, Canada and Spain. Released globally on Monday October 20, 2008, Black Ice topped sales charts in 29 Countries, including the US where it sold an incredible 784,288 in its first week (marking the band’s first ever debut on the US album charts). Black Ice went on to sell another 270,923 units this week, bringing the first 2 weeks sales in the US to over 1 million copies. 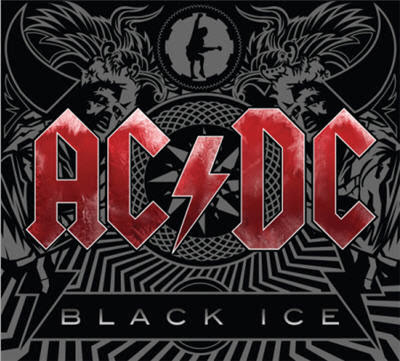 Sold exclusively at Walmart, Sam's Club, and www.acdc.com in the US , Black Ice is poised to be the biggest selling rock record of 2008. For the first time in the band’s extensive history, AC/DC grace the cover of Rolling Stone magazine. Additionally AC/DC are the first band to release an entire album for video game play with the release this week of The AC/DC LIVE: Rock Band® Track Pack™. AC/DC LIVE: Rock Band® Track Pack™, gives music fans a whole new way to experience rock’s hardest hitting act with access to 18 live recordings from AC/DC’s epic, live performance at Castle Donington. Columbia Records have partnered with Walmart and MTV to create “AC/DC Rock Band Stores” in New York’s Times Square and in Los Angeles to give fans in the these cities fast access to all AC/DC music and merchandise. Five for Fighting’s “World” will be featured in Sears’2008 holiday campaign. “World”, taken from Five for Fighting’s 2006 release Two Lights, can be found in television spots promoting Sears’ theme of granting wishes. The ad focuses on those who fulfill their own positive destinies, from celebrities such as LL Cool J and Vanessa Hudgens to normal, unknown American citizens, such as a disabled veteran, who overcome adversity and achieve ultimate success. Not too many bands come back 8 years later and have AC/DC's success. Great post! And I'm very glad you are doing this every Monday! I find it highly appropriate that your first date was at the zoo. She got to not only hang out with you, but meet your relatives as well. That's nice. Cheers Vin!! Happy anniversary to you and Nancy. I understand that the AC/DC album is outstanding. Unfortunately, I have an issue with artists who decide to make their CD's available exclusively through only one retailer (Wal-Mart, in this case). BUD: Thanks and it is incredible how well they are doing..
MATT-MAN: Bwahahahaahahaha oh that was funny...bwahahahahahahaa umm maybe not! RWA: I agree with that complaint...but unfortunately, it appears Wal Mart has plenty of money to buy these arrangements. Hey Vinnybond...I just really needed to come by and chill on your couch this morning. Hugs my friend. Thank You for he great post. I still love AC/DC mostly because listening to them brings back all the great memories of blasting their music while at parties in high school and college. JAY: You SHOOOOOK ME alll night looong (hiccup...barf)...Those great memories? NANCY: Wait...you mean we passed 4 dates and all I am getting is a kiss on the cheek still???????? I love Five For Fighting. They're one of my favorite groups. By the way, that sofa --I've always wanted one ever since I saw it in the movie "Giant." Paul Jeffrey even sent me an email and even though he was shamelessly (and admittingly) attempting to increase his album ales, I found the gesture quite nice. I'm still drooling over Slayer and AC/DC in the same post. You do know I'm a headbanger at heart, right?? You may want to change your link so you can click right to me again. Glad he reached out, even with an ulterior motive! I want to go see them in Milan! That's nice of the chap to email and thank you. I definitely like this feature on Monday. I got an email from Paul Jeffrey too. I think it's cool to support small market artists. They can't all be AC/DC! A year already? Wow, that's fantastic. Congrats to you both. I'm happy you've found love. I love Five for Fighting. I saw him live a couple of years ago at a holiday concert and he sing with such soul. He's amazing. Happy Anniversary to you both! Kiss on the cheek still...LOL. I love Five for Fighting...and have loved AC/DC for years - Las Vegas Thunder (IHL Hockey Team) used it for their opening and we LOVED it. Got an e-mail from Paul too, that was cool. First of all, congrats to you and Nancy. I hope you all celebrated in a wonderful way. I'm laughing over Matty's comment, because it was soooooo like him. TRAVIS: And some don't want to be..and there are some gems out there performing. DRILLERAA: Absolutely...but it is more grassroots and not the big companies deciding what we ant to hear. MAGS: Yup a year...Thanks from the both of us. TUG: Thank you from us both...and for the kiss..Glad you also heard from him. Remember what? Did you say something? What happened to the 70's??? I am a slow mover - what can i tell you! HA! so she sees right through coy, doesn't she... hehehe! The woman raised you, she knows. Mom always knows. I love Five For Fighting. Love John. He is awesome. He fits in nicely with Train, Ryan Adams, and David Gray.